Croatia became independent from the former Yugoslavia in 1991, the same year that Zagreb was made the capital of this country. Now part of the European Union, the country has benefited from the financial help that has come from being a member state. Electric trams were first introduced in 1910 and over the years since the Second World War the network has developed into a modern efficient system. The trams are operated by ZET (Zagrebački električni tramvaj) and currently have 15 daytime and 4 night time routes. There are five types of trams operating on the system, the oldest dating from 1974/5 are Yugoslavian built Đuro Đakovic TMK 201 cars, next oldest are 1976-1982 ČKD Tatra T4YU cars. Further Tatra cars are the KT4YU type dating from 1985/6. The first low floor cars are sixteen TMK 2100 trams built by Končar in 1994. Current modern deliveries are the TMK 2200 and TMK 2300 cars built locally by Crotram of which deliveries started in 1997. Our filming begins in the grand square in the centre of the city. Known as Trg Josipa Jelačića, it is the perfect place to start our tour of this beautiful city as most types of tram pass through. We move along to Ul. Nikolejurišića and Draskovićeva filming as we go before boarding Crotram TMK 2200, number 2202 on route 12 to Ljubljanica. With more filming completed at our destination we travel on Tatra KT4YU, number 337 on route 9 to Branimirova, which is the location of the central railway station in Zagreb. Again a brilliant place to see all types of tram in service on this very hot sunny day. Our next ride is a real treat! We get a driver’s eye view of route 2 to Savišće as we ride on Tram 212+701, a Đuro Đakovic TMK 201. On arrival we change to the trailer car for our ride to Autobusni Kolodvor, which is outside the main bus station also on route 2. From here we travel to Bukovačka and sample the delights of tram 2112, which is a Končar TMK 2100. With more filming completed at this destination we board Tatra T4YU, number 435+846 for a ride to Šubićeva to change to route 17 back to Trg Josipa Jelaćica, this time on board tram 2114 a Konćar TMK 2100. More of the action is recorded in the city centre. Now it is time for a complete change of scene! Our cameras are at Mihaljevac, north of the city centre, where there is a short tram route, number 15 that goes up a hill to the village of Dolje. Popular with hill walkers in the summer, this short tram route serves just three stops and then goes around the loop and returns to Mihaljevac where it connects with tram routes 8 and 14. Our cameras travel on board Tatra T4YU, number 445 and return on tram 467. Further filming takes place on Avenija Dubrava, before our final shots at Autobusni Kolodvar on Avenija Marina Držića. 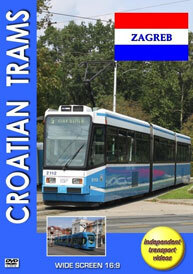 To end our programme we include a series of photographs of Zagreb trams taken by Steve Kelly during his visit in 2002. We hope you enjoy your visit! Duration : 80 minutes (approx).